A NanoFET - a nano-particle field extraction thruster uses nanoparticles as propellant. The "engine" is etched onto wafer-thin silicon; with fuel, it is about one centimeter thick. Tens of thousands of accelerators fit onto the area of a postage stamp. NanoFETs work like miniaturized versions of particle accelerators. 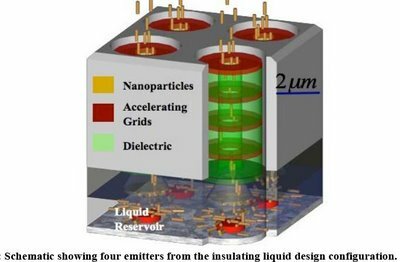 NanoFET is essentially a "stick-on" thruster that could power small spacecraft or devices over large distances for long space missions. NanoFET systems can deliver up to ten times the thrust of an ion engine; they offer high efficiency, lower thruster specific mass and longer operational lifetimes. Since the nanoparticles are charged electrostatically rather than ionized as in ion or Hall thrusters, greater reliability and efficiency can be achieved. Without the need to ionize propellant, nanoFET does not experience charge exchange (CEX) collisions between high energy charged and slow moving neutral particles. NanoFETs offer a wide span of thrust-to-power ratios at very high efficiency in a single package. This provides mission designers with a great deal of flexibility. From the conceptual standpoint, NanoFETs are miniaturized versions of sf writer Murray Leinster's pushpots, small rocket motors that could be attached to objects and push them into space. Bigger object? Attach more pushpots. Read more at Next Big Future.